Fusion Summon 1 “Ancient Gear” Fusion Monster from your Extra Deck, using monsters from your hand or field as Fusion Material. If you use “Ancient Gear Golem” or “Ancient Gear Golem – Ultimate Pound” you control as Fusion Material, you can also use monsters from your Deck as material. Ancient Gear Fusion is a card the archetype needed. A fusion-based deck is always looking for the quickest, easiest way to Fusion Summon, and for Ancient Gear they have it in Ancient Gear Fusion. AGF acts like Poly, but if you are using Ultimate Pound or Gear Golem you can also use from the deck. That last little bit is a huge difference. Hand investment minimized and deck thinning added are two things any deck would like. Any Ancient Gear Fusion monster needs at least 2 monsters for the summon, to be able to use your deck for this in addition to one monster in your hand is a fantastic plus for the deck. Simple card for the deck to use. No cost, helps to make their fusions more playable by easing the summoning investment. One more thing, no “once per turn” restriction. Chaos Ancient Gear Giant requires 4 Ancient Gears, to bring out 2 in a turn using 2 of this card and two Ancient Gear Golem or Ultimate Pound from the hand and the rest (6 total monsters for the two summons) from the deck…wow. Alright, I’m Jealous. 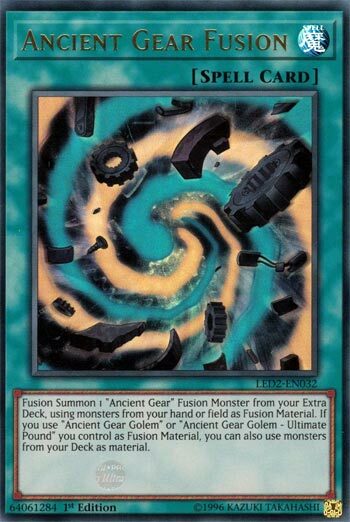 Ancient Gear Fusion is a Normal Spell Card that Fusion Summons one Ancient Gear monster. There is no once per turn restriction on this card. That’s the reason I’m jealous. I want Construct back. Anyway, you can use monsters from the deck as material if you’re using Ancient Gear Golem or Ultimate Pound from your hand or your field. Shaddoll Fusion needs there to be an Extra Deck monster on the opponent’s field. More jealousy. I’ll never get over this. Bring Stratos back for good measure. Ancient Gear Fusion is great. Own it if you can. Another card for another archetype that was supported in the second Legendary Duelists, today we look at what is probably the chase card of the set, based on the price tag it holds, and that is Ancient Gear Fusion. AGF is a Normal Spell that does what you expect it to do, Fusion Summon an Ancient Gear using monsters in the hand or field as materials. Basically a searchable Polymerization for Ancient Gears. However, if you have either Ancient Gear Golem or Ancient Gear Golem – Ultimate Pound on the field and you use it as material, you can use the deck for Fusion Materials as well. Nice to see another Fusion card let you use the deck for the materials. You are more than likely going to have better cards to use as material in your deck than you are in your hand or field. Sure you have to control one of the two Ancient Gear Golems, but the original Golem isn’t bad, so if you can get it on the field, Ancient Gear Catapult ignores summoning conditions and Howitzer does as well. This is overall nice for Ancient Gears to have, another Fusion Spell will not hurt, especially since this can replace Poly now. You will probably play this in an Ancient Gear deck along with the Hunting Hounds, as Fusion Summoning is really good in Ancient Gears. Art: 4/5 Looks nice for what you would expect for art on a Fusion card. Ancient Gear Fusion is a very simple, and useful Magic card. First, this should be a Quickplay, like Super Polymerization. It wouldn’t make this card broken, and being able to throw out a Fusion on the opponent’s turn is awesome. So in short, you get to Fusion Summon an Ancient Gear card, and your Hand or Field can be used for Material. You can use the Deck too if you control Ancient Gear Golem or AGG-Ultimate Pound, so that’s a neat bonus. It’s a nice little weapon in the all ready (over)loaded Gear Golem arsenal.